What’s the first thing that you do when you notice that your drain has clogged? Probably reach for the bottle of drain cleaner under the sink right? What if I told you that is actually doing more harm to your drain than good? Store bought drain cleaners may clean out your drains pretty well, but they do it at a pretty significant cost. One that most people are paying without realizing it. Read on to find out more about why it’s so important that you schedule professional drain cleaning services whenever you notice a clog in your system, instead of reaching for the bottle of drain cleaner. The reason those store-bought drain cleaners can clean out your drains so easily is because they tend to use a range of highly corrosive chemicals. 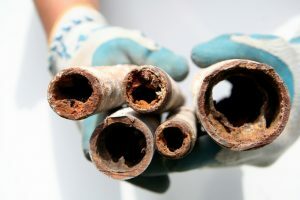 These chemicals can eat through pretty much anything that may be clogging your pipes, which is good, but they also corrode the pipes themselves. Not to mention that accidental exposure to these kinds of substances is not good for your health, either. Years of using these kinds of chemicals will make your pipes weaker, and more prone to leaks. You may even have to replace large sections of the pipe years earlier than you normally would. That’s a pretty hefty price to pay for not a lot of benefit. If you want to keep your pipes in good shape, you should make use of professional drain cleaning services instead. Professional plumbers are well-aware of the kinds of damage that store-bought drain cleaning products can do to the drains, which is part of the reason why they don’t use those products themselves. When you contact a professional contractor to handle your drain cleaning, they will often use either a drain snake or hydro jet. A drain snake is a cord with a drill bit at the end of it. The snake is inserted into the drain until it meets the clog, at which point it drills through it. Hydro jetting, by contrast, fires a high-pressure stream of water into the drain pipe to clean it out. Think of it as being similar to a tiny fire hose. The hydro jet can blast through the clog itself, as well as clean out any other waste that may be clinging to the pipe. Either of these methods are much better for the health of your pipes, clean them out more thoroughly, and generally keep your system functioning better in the long run. So, if you think you may have a clog developing in your pipes, do the smart thing and call a professional instead of trying to resolve it yourself. You’ll be much better off in the long run. Saddleback Plumbing offers a full range of drain cleaning services. If you’re looking for the best plumber in San Juan Capistrano, we can help you out. Contact us today to schedule an appointment with one of our professional plumbers.